Tree propagation experts from A.M.A. 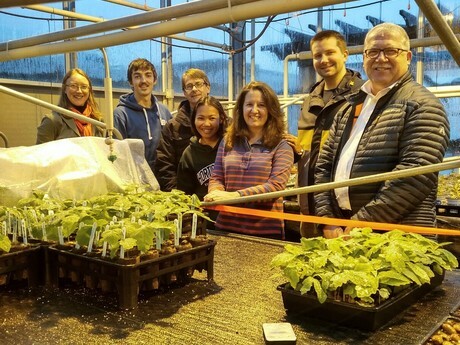 and Vineland Research and Innovation Centre visited Niagara College and Guelph University in November to meet the next generation of top horticulture talent and discuss the science of healthy roots. More than 100 horticulture students from Niagara College’s School of Environment and Horticulture Programs and the University of Guelph’s Department of Plant Agriculture had the opportunity to learn about RootSmart, an innovative propagation tray developed by Vineland and commercialized by A.M.A. Students and researchers at both institutions have been conducting trials comparing trees grown in the RootSmart tray with trees grown in other propagation trays. At Niagara College, second-year Horticulture students are using RootSmart to determine the optimal propagation method for oak seedlings. The results of the students’ RootSmart trials continue to be overwhelmingly positive. “It is a pleasure using the RootSmart propagation tray. 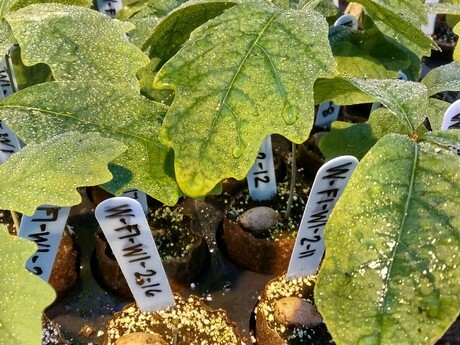 It promotes quality root systems that will ensure the oak seedlings become healthy, long-lived trees when they are transplanted out into the community,” says Clark. RootSmart’s wall-less, bottomless design promotes a healthy root distribution and helps to prevent the common and costly problem of root defects like circling, diving, ascending or kinked roots. Defects often occur when roots come into contact with the walls of a growing container or tray, rerouting growth in an unnatural direction. A.M.A.’s Craig Willett and Rick Bradt also spoke with the students about their experience working with Vineland to commercialize RootSmart. After their presentation, the students took the A.M.A. and Vineland guests on a tour, showcasing their RootSmart trials and some of the other innovation underway, including tissue culture research. Learn more about the research behind RootSmart at www.rootsmart.com.